Welcome to The Venue Green Park, the trendsetter in transforming your imagination into an unforgettable affair. We grace the open skies on the 20th floor of the Green Park building in Morningside, which is easily accessible from the M1 highway, and there is ample undercover parking for clients' peace of mind and convenience. The Venue Green Park offers a spectacular panoramic view of the city & skyline which is complimented by our in-house turnkey solutions. 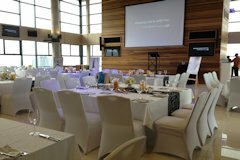 Our venue is an exquisite day or night show off piece for your next corporate function.